As ou r Executive Claims Consultant, I frequently assist clients and insurance company partners with difficult and complex claims situations. Due to the unique plumbing used for this particular sump pump, the back-up not only caused water damage in the basement around the sump, but on the exterior of the home as well. 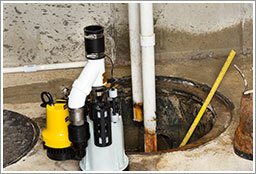 A pipe from the sump pump leading out of the house began to leak. That water landed on the ground, and then ran directly in through a basement window causing more damage to drywall. The carrier paid for the damages from the water that backed up through the sump, but they denied the other damage as being caused by surface water. Surface water coming into your home is not covered by this endorsement. They said that once any water hit the ground, no matter it’s source, it was considered surface water and damage caused by it was excluded. Through a thorough investigation, I was able to determine that the exterior water damage was in fact due to the sump pump back-up. Due to our closer examination and review with the carrier, we were able to get that denial reversed and have the additional water damage covered. Reviewing complex claims with our Business and Personal Insurance clients is a value added service that R&R is able to provide. With 20 years of claims experience, as well as a legal degree, I understand the importance of walking through difficult situations step-by-step to provide our clients the proper coverage. Please note that R&R Insurance Services, Inc. is not a law firm. 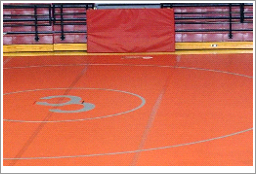 Brian Bean does not provide legal representation to clients of R&R Insurance Services, Inc., or to R&R Insurance Services, Inc.
A tragic accident at a North Carolina high school wrestling meet in 2014 led to heightened regulations on mat thickness and placement. When no-1 ranked wrestler, Luke Hampton, attempted to drive his opponent backward he wound up headfirst in a padded wall - leaving him completely paralyzed from the neck down. Today, 12 inches of padding is recommended with it extending at least 8 feet beyond the area of activity. In order to ensure you’re meeting regulations, visit the ASTM Standards 1292 – an excellent guide for mats and protective surfacing. Suppliers are also a reliable source for recommended protection. Established in 1898 originally as the American Society for Testing and Materials, ASTM International is one of the largest voluntary standards developing organizations in the world. ASTM is a not-for-profit organization that provides a forum for the development and publication of international voluntary consensus standards for materials, products, systems and services. ASTM’s members, including producers, users, and consumers from more than 150 countries, develop technical documents that are a basis for manufacturing, management, procurement, codes and regulations. Contact our Knowledge Brokers for additional information. Back in 2012 the State of South Carolina suffered a breach that exposed 3.8 million taxpayers, 1.9 million dependents, 700,000 businesses and 3.3 million bank accounts. The Breach occurred because an employee inadvertently opened a pfishing email. This error cost the state over $20 million—all because of an email. The State didn’t realize that they had been attacked until notified by law enforcement. Lockhead Martin had discovered an attack of their network that came in the form of emails sent to employees that had attended a conference by sending emails that appeared to send follow up slides and information to the conference attendees. The FBI reported that the landscape for cyber crimes is changing to state sponsored attacks, i.e. countries trying to steal US companies R&D trade secrets from the private sector. Attacks are advanced and aggressive. As individuals we should be aware that our greatest vulnerability is using credit/debit cards at places such as gas pumps, bus rides, remote vendors, etc. Companies that accept credit cards and are PCI compliant need to realize that this compliance is a baseline minimum. The biggest threat to networks are the employees: "Think before you click" / "Beware before you share" should be the mantra. Businesses need to promote a culture of security awareness. No matter what precautions a company takes, you will never get ahead of a hacker. The speakers included representatives from Utility Companies, Banking, Security Consulting, FBI, SC Dept of Revenue, and The State of Wisconsin National Guard/Homeland Security. See the conversation on Twitter by searching #WICyber. 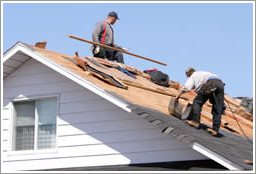 After turbulent winter weather and heavy rainstorms in spring, roofs take a beating from the elements. And wherever you find damage, unfortunately you also find scams. In the Milwaukee area, storm chasers have been known to blanket an area hit by hail or wind damage and look for unsuspecting homeowners. They’ll pass out leaflets, show up unannounced, and offer a free inspection. The scammers know the claims process with insurance companies, and based on the square footage of the roof, they can figure out how much it will cost to put on a cheap new roof. The catch is that the storm chaser does the bare minimum to replace the roof and usually pushes the homeowner to move forward with the repairs before the insurance company has a chance to inspect the damage. The homeowner is then left with a poorly constructed roof and a claim that potentially could be denied by the insurance company because the roofers often cause the damage. A reminder from our friends at Kelman Restoration - certain things should never be put in the dishwasher. As the photo shows us, never put a wooden spoon in your dishwasher. 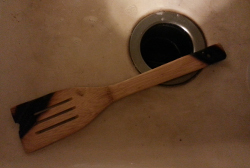 In the case of this insured, the spoon fell between the cracks and landed on top of the heat coil, resulting in a fire. Remember, dishwashers can catch on fire. Wisconsin residents, contact a R&R knowledgebroker to ensure all aspects of your home are properly covered. 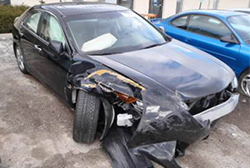 One of our clients was driving home from work when another driver hit her 2009 Acura TSX 4-door sedan. Our insured and her older daughter were injured. Her newborn baby daughter was unharmed (thank goodness for the child safety seat). After a visit to the hospital, I am happy to report that the family will be fine. I wish I could say more for her car - her 2009 Acura was totaled. You can see from the picture that the front end sustained enough damage that it could not be repaired. The accident was so severe that several of the airbags went off. So, when does $60 = $13,000? Recently, some insurance companies started offering 'Car Damage Replacement Coverage' on new cars. The cost for the endorsement is around $20-$35 a year. Our insured owned this car for 3 years and her cost to have this on her policy would have been $60 over 3 years. Our insured declined this coverage when she bought the car. She probably thought, "I’m a good driver”. Problem is, we don’t know about the drivers around us. When the dust settled, our client will receive what the value of her car was worth (fancy insurance term is 'Actual Cash Value') right before the accident. This is how typical claims are settled. Had she added the Car Damage Replacement Cost endorsement, she would be driving in a brand new Acura TSX. The difference between the value of her car and a new Acura is around $13,000. This is when $60 = $13,000! Not all insurance companies offer this endorsement so please check with us when you add a new car to your policy. Wisconsin residents, now is a great time to contact us about any questions you might have on your auto, home, or life insurance! 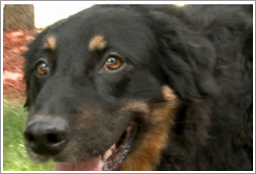 Wisconsin residents can have the same peace-of-mind that the Staab's experienced. Contact knowledgebroker Dan Wolfgram for more information about personal insurance options through R&R Insurance Services. Jay Mueller, Whitefish Bay, Wisconsin resident and long-time personal lines customer of R&R Insurance Services, explains that even with 5 kids behind the wheel and a few minor accidents along the way, dealing with his insurance agent has been "painless".